This article explains why an email may be stuck in Outlook and how to force it to send or delete such a message from the Outbox of Outlook 2016, 2013, 2010, 2007 and lower. Email messages may be stuck in the Outbox folder for various reasons. In this article we will try to figure out why this happens and how to delete a stuck message or make a hanging e-mail send. If you do not care about the reason and just want a quick solution to delete a stuck email, proceed straight away to 4 quick ways to delete an email stuck in Outlook Outbox. If you are more patient and curious and are interested to know the reasons why emails may become stuck in Outlook's Outbox, read through the points below. This will help you understand what exactly can force a message to hang and how to prevent this from happening in the future. As you know, without a correct diagnosis, there is no cure. Attaching a large file that exceeds the size limit set by your mail server is one of the most frequent reasons why Outlook is not sending emails from Outbox. When this occurs, you have two alternatives - either to delete it or move to the Drafts folder and then re-size or remove the attachment. To delete an email stuck in Outbox, first go to the Send/Receive tab and click Work Offline. This will prevent Outlook from sending email messages that are currently in the Outbox folder. After that switch to Outbox, right-click the message and select Delete. To remove/resize the attachment, set Outlook in the Offline mode as described above, navigate to the Outbox folder and drag the stuck message to the Drafts folder to make edits. Alternatively, you can right-click the email, select Move from the context menu and then choose Other Folder > Drafts. Note: If you get the error "Outlook has already begun transmitting this message" when trying to delete or move a hanging email, wait a bit and give Outlook a chance to finish sending. If it did get stuck, see how to delete a hanging email. Tips: Instead of sending huge attachments you can upload large files onto your local network share and simply include a corresponding link in the message. If you are at home or on the road, you can use one of the file sharing services like Dropbox or SkyDrive. Alternatively, you can create an Outlook rule that defers sending messages with large attachments. Of course, this won't solve the problem completely, but will give you time to cancel sending an e-mail that exceeds the size limit set by your email provider and help to avoid the problem. 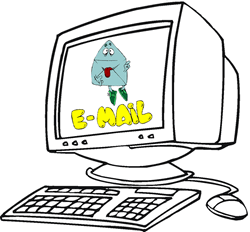 If you open an e-mail message whilst it is in your Outbox waiting to be sent (and even if you are only looking in the Outbox folder while the message is still there), such an e-mail will be marked as read and won't go. The title of the message will no longer appear in bold, and this is the most obvious symptom telling you that the message is stuck. This behavior is caused by a number of Outlook add-ins, the most known of which are Business Contact Manager (BCM), Social Connector add-in, Xobni, iTunes Outlook Addin, iCoud add-in and many others. Uninstalling or disabling such add-ins may help, but this is definitely not the best way to proceed because you may really need at least some of them for your work. An easy and effective way to send a message stuck in the Outbox is this: drag the stuck message from Outbox to any other folder, e.g. to Drafts, go to that folder, open the email and click the Send button. You can find full details here: How to quickly resend a message stuck in the Outbox. In the future, simply try to avoid viewing the Outbox while there are some messages in it. Symptom: you have created a new or modified an existing email account, or recently changed the password on your Internet email account. You can verify whether your password is correct by logging to your email account from the web. 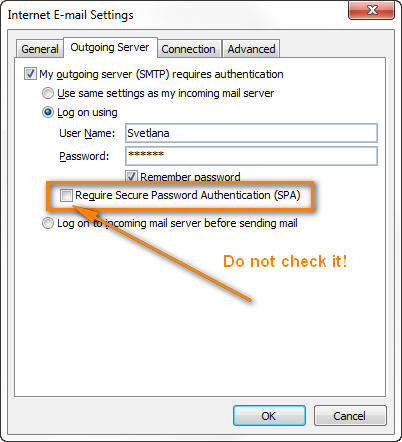 If recently you have changed the password on your Internet mail account such as Gmail or Outlook.com, you need to change your account password in Outlook too. Go to the File tab > Info, and then select Account Settings twice. In the Account Settings dialog window, select the account where you need to change the password and click the Change... button. Type a new password into the corresponding field and click Next > Finish. The first thing for you to do is to check the settings of your email account. In Outlook 2016, 2013 and 2010, go to the File tab and click Account Settings twice like we've just done when changing the email account password. 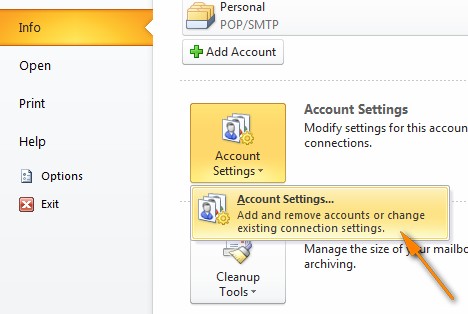 In Outlook 2007, navigate to the Tools menu > Account Settings > Email. 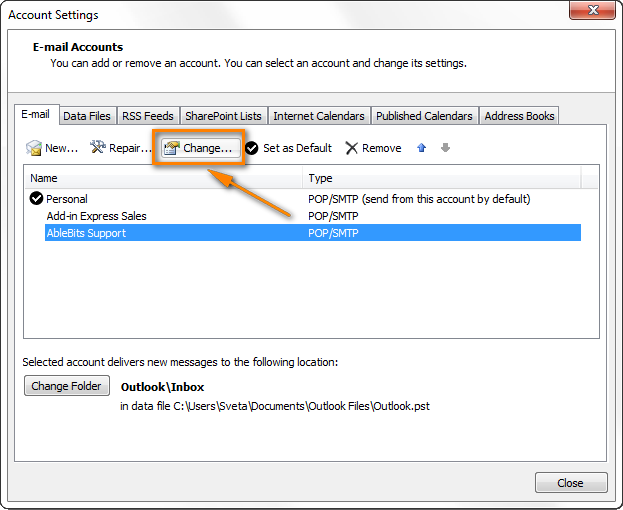 In Outlook 2003 and earlier, head over to Tools > E-mail accounts > View or Change existing accounts. Double click on the account, and then click Tools menu > Account Settings > Email. Switch to the Outgoing server tab and make sure that your settings exactly match those recommended by your email provider. Keep in mind that some providers may require a password to send email. And don't check the "Require Secure Password Authentication" option unless your mail server explicitly requires this. Usually port 25 is used for SMTP accounts, though these days email providers tend to move to port 587. 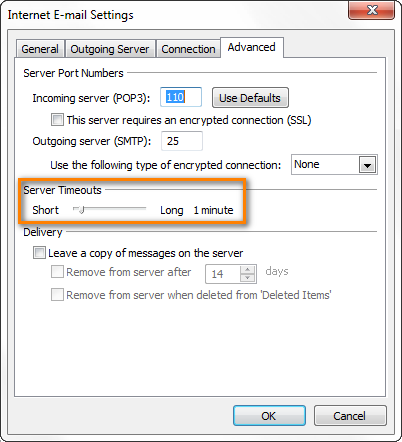 SMTP connections secured by an encrypted connection SSL work on TCP port 465. POP accounts usually run on port 110. IMAP email accounts use port 143. If you use Gmail as a POP account, enter 995 on the "Incoming server (POP3)" field and 465 on the "Outgoing server (SMTP)" field. Select the option "This server requires an encrypted connection (SSL)" . If you use Gmail as an IMAP account, enter 993 on the "Incoming server (POP3)" field and 587 on "Outgoing server (SMTP)". Check the box "This server requires an encrypted connection (SSL)" . You can find the detailed step-by-step guidance for setting up Gmail accounts in this article: Configuring the Outlook Gmail settings. Symptom: You can neither send nor receive email but you can access the Internet. To get connected, go to the Send / Receive tab, Preferences group and click the Work Offline button to toggle it off and bring you back online. 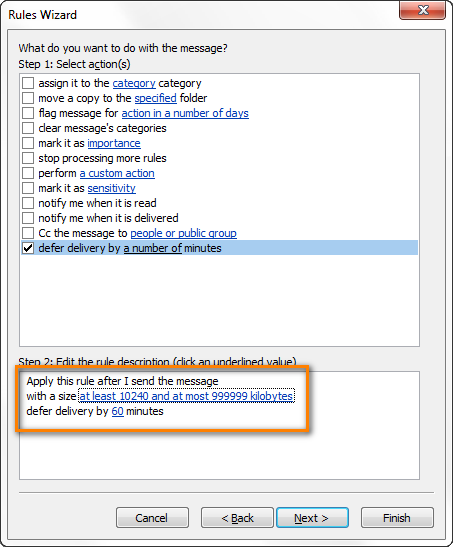 Symptom: you are able to reply to emails but cannot send the newly created messages. One of the possible reasons might be configuring your email account using a pre-configured script provided by your admin. You can see which of your email accounts is the default one, if any, by opening the Account Setting dialog. In Outlook 2016, 2013 and 2010, you go to File >Account Settings. For Outlook 2007 and older, please see the above instructions. The default Outlook account has a corresponding note next to it and a little tick left to it, as you can see in the screenshot below. If none of your email accounts is chosen as the default one, select the needed account by clicking on it and then click Set as Default. Symptoms: Sending email works for a while, then stops and messages become stuck in the Outbox. You may also get the following error when trying to send, receive, read or delete a message: An unknown error has occurred. 0x80040119 or 0x80040600. Use Task Manager to ensure there are no hanging outlook.exe processes. 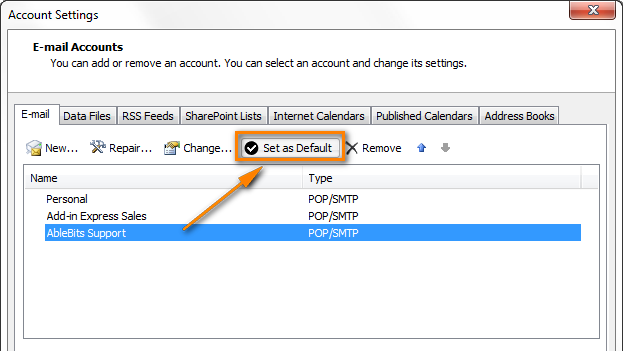 See how to remove hanging Outlook processes correctly. You can also use the Inbox Repair Tool to scan the .pst file for errors and repair it. The Inbox Repair Tool resides in various locations, depending on your operating system. Please use the instructions provided by Microsoft for different Windows versions: How to resolve "An unknown error has occurred" error. If the above does not help, disable or uninstall the software causing the problems. Symptoms: similar to the previous point. If the antivirus program is casing issues with sending email, first of all check your antivirus manufacture's web-site for updates, and then forums or user communities for solutions and workarounds. Disabling email scanning may help too. You should not be afraid to do this because this option is not really necessary, it is simply an extra precaution or maybe a holdover from the early days of anti-virus programs. In fact, even with the email scanning option turned off, all modern antivirus software will continue to work and check incoming files as they are saved to your hard drive, including email messages and attachments. Also, you can try to set a timeout by going to Account Settings > More Settings > Advanced tab. If the above does not help, look for an alternative antivirus program. You may have a great temptation not to use any antivirus at all, but think twice before doing this. As you understand, this would leave your computer vulnerable and defenseless against viruses and malicious software that are in abundance these days and which could permanently destroy your system and information you store on your hard drive. As they say "of two evils..."
65 Responses to "Why an email gets stuck in Outlook Outbox and how to delete a hanging message or make it send"
I've never used the Simply file add-on and even never heard of it. If you think this add-in is causing problems to your Outlook, then you can temporary disable it and check if the problem is gone. If so, then there is definitely a conflict. In this case, I believe the best way is to contact the manufacture's support, hopefully they will be able to provide an update or fix. Hi, I am getting desperate! I use gmail via Outlook 2003 (POP3 port 995 and SMTP 465). Since 23rd January 2014 (right after midnight, while I was stil online) I mostly (!) cannot send emails - they get stuck in Outbox. I did however successfully sent a couple of testing emails (from Tools menu testing as well as plain txt emails to my husband), yet I took me 5 - 7 retrial send/receive clicking. Email with attachment is mission impossible to get through. Also strange is the fact when sending test email (Test account settings) tonight, I got the reply "specified server was found, but there was no response from the server. Please verify ssl information...." yet I received two testing emails anyway? On the other hand in the send/receive progress window "sending complete" information occured, but the email got stuck in Outbox despite that. If the above does not help, then try contacting the support service of your ISP and Google. Thank you for your answer. The port 25 is blocked by my ISP. I gave up and handed my comp to my IT guys. Don't know what they did (apart from upgrade to Office 2010), but now it works - again. Thank you, this worked a treat, the bit about moving from Outbox to Drafts, then opening and resending. For years, I have been copying the content into a new email, then copying the subject and recipients etc etc and then having to delete the original one, what a pain. I'm glad to know it's been helpful to you! And I'm a bit jealous, we are having a severe frost here, about -20C (-4F) degrees. I use this "trick" as well. My issue is that it happens so often that it is obviously a serious bug with Outlook. I find it unacceptable that this is Microsoft's answer to dealing with this. It means that if I am sending lots of emails I must sit and wait to see that they all go through. I may as well ditch outlook and get a fax machine! This is not Microsoft's answer. This is our company's blog and all the solutions and fixes you see on this page are from our own experience. Our company (Add-in Express Ltd.) has no relation to the Microsoft corporation or Microsoft products, except that we are one of millions of users that use their products. If you want an official Microsoft answer, you may try to reach their support team. Maybe they will hear you and finally work out a fix for this issue. YEAH!!!!! You fixed it, delete the message when working offline!!!! Which account type do you have - IMAP, POP/SMTP or Exchange server? Also, what anti-virus software do you have installed? Does the stuck message contain an attachment? Thanks! That stuck email was giving me an issue! Nice job on the rule too. Sent emails are in my outbox. My colleagues can see them from their Pc but I cannot? Please specify what exactly you mean when you say that other users can see your e-mails? Do they see them in their Inboxes? Or, do you use public folders on the Exchange server? Hi I have this same problem, there are emails in my outbox but they are not visible to me. My colleagues have access to my emails from their computer for when I am out of the office and they can see 4 emails sitting in my outbox but I can't see them from my side. How do I make these visible? I use outlook 2010 - Have just move ISP to BT - now when I send an email it transfers to my outbox. If I go to outbox it is "bold" if I double click it brings up the email again "in Italics" I click send and it goes. It is almost as if a "delayed" setting has been applied but when I go into the settings no delay is registered. Help please. Make sure you have the "Send Immediately when connected" option selected under Options > Advanced > Send & Receive. Yes the box is ticked "to send immediately" and I did look at the "deferred delivery" to see if there was an instruction but there is not so I assume this also means send immediately. I am using outlook 2010 and recently changed ISP to BTinternet - the outlook box that mail goes into is in the Data file - again I am not certain if this has a bearing. If you have any other thoughts I would be most grateful. - Do you have 1 or several accounts in Outlook? If the latter, do you have the same issue in all of the accounts? - If you have any third-party Outlook add-ins installed, try to temporary disable them one by one and each time check sending. Do the same for anti-virus software. If nothing helps, maybe you can contact BTinternet suport to check whether it is a known issue? I'm having the above problem and I've tried all your steps and nothing is working! can you help? I have a hotmail account linked to outlook which worked for a few days and now messages are permenantly stuck in the outbox, they can't even be moved into the drafts folder. I have windows firewall turned on and AVG free antivirus, Thanks. 1. Temporary turn off AVG free antivirus and see if this helps. 2. Try to send a very short test e-mail and see if it gets stuck too. 3. Contact Hotmail support to find out whether this is a known issue. 4. If you recently have installed any Outlook add-ins, disable them and check sending again. Thanks for coming back to me again. I will try your suggestions and if all else fails I will phone BT or even call in Dynamo the Magician to see if he can help. Is it possible to send a screen shot to you as my explanation may not be as good as a picture. Of course, you can send me a screenshot at support@ablebits.com. I have experienced most of the problems I read about here and thanks for the help. But lately I noticed Outlook 2007 hangs up completely if I try to send mail with attachment greater than 5MB. All open Outlook windows go completely dead and I have to stop the application with Task Manager. The program stops instantly when I click the Send button, so I don't think it's a problem with the IP (Google) and it all works fine as long as I don't attach any files over 5Mb. There are no error messages so it's hard to diagnose the problem. Tried searching several other forums and nobody reports exactly this behavior. I reduced .pst size to less than 2GB, it makes no difference. I'm running Windows7, with Google as IP, outgoing server IMAP, port 465, SSL. This is a strange issue, we have never been reported about such behavior before. Just in case, make sure you are not trying to send .exe or.zip files. 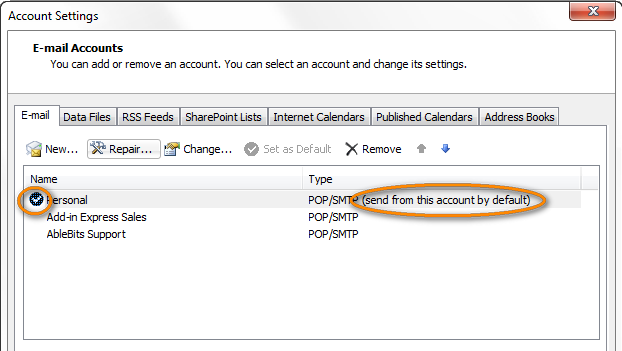 Also, if you have 2 accounts in Outlook, try to send an attachment to your second account. The same problem? I recently switched to Windows 8 and Outlook 365. At first, my Outlook worked fine, but then I started to notice mail stuck in my Outbox. I have checked out all of the steps above and nothing works. I contacted Digis and they said that it was not anything that they could fix. It is a problem with Outlook. I receive mail with no problems. My Account Settings are all as configured by Digis. I have sent and received "test" messages from within the Account Settings windows, but I still cannot send my own "test" message using the Send/Receive button. It still sits in the Outbox. I have restarted the computer and restarted Outlook. I have even run the Repair function. Nothing works. I turned off AVG - no change. I am about ready to switch to Incredimail. You can make the following test that will hopefully help determine the cause of the problem. 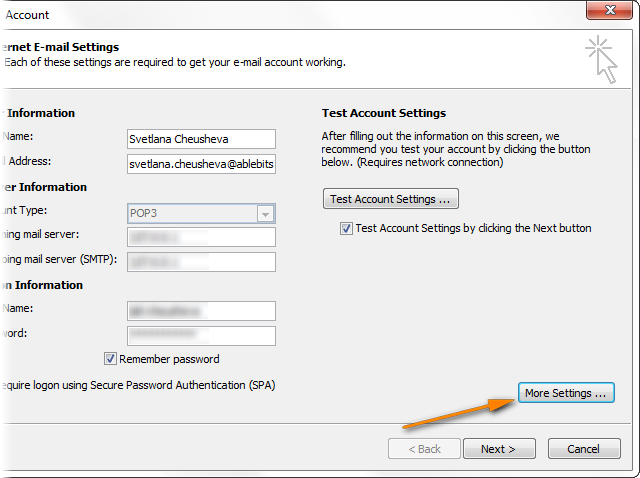 Create a test Gmail account, then create a new account in your Outlook with that gmail address and try to send messages from the new account. If it works fine, then there is definitely a problem with your main email provider. BTW, what version (plan) of Office 365 do you have? I am sorry, this is very difficult to determine the root of the problem remotely. You'd better contact Microsoft support with this issue. After going through your much appreciated suggestions, I finally did the following and solved my 2010 OUTBOX problem: Go to Outlook/File/Options/Advanced/Send and receive: Check the box with (Send immediately when connected). This solved my issue, and perhaps may help someone else. Thanks Svetlana for all your suggestions. It's great you take the effort to help people, and sorry for sharing another problem with you. I carefully studied your list of malfunctions but mine isn't there. Here is my case: I have Windows 8 and Outlook 2013 (365), which works well at home (using wifi). When I connect by another wifi network, I can still receive mail, but I cannot send any. The mails are stuck in the outbox. Back home they are sent at once. With my previous laptop (Windows 7 and Outlook 2010), I didn't have this problem using the same wifi networks outdoors. By the way, I use the IMAP / SMTP protocol. Most likely the administrator of your second network disallowed sending email using that network, i.e. closed the SMTP port. Your software update at the same time may be a mere coincidence. Another possible reason that your antivirus software forbids sending email from that network (in fact, this is very unlikely, but may happen in theory). That is quite likely; some ISP will only allow you to send email from their own servers, so on your home network using myISP.net all is well, in another location eg myneighboursISP.com you cannot send mail. It would surprise me however if mylocalcoffeeshopISP.net would prevent sending mail in this way. I had the same exact problem. Email from Home network would leave outbox but when on certain (not all) other networks, they would get stuck. My solution was to change port. It was set to 25 and in my case I switched to 587. I had this exact same problem and for the life of me couldn't figure out what was causing it. I called Office 365 support and they didn't have a solution either. I even did a hard reset on the router and no difference. Out of desperation, I swapped out their D-Link Router with a Linksys router and the problem disappeared. There may have been a setting on the D-Link router I could have changed, but I figured a hard reset should let email pass through, so I just swapped out the router. I thought I would post this in case others were having the same issue. Thank you very much for sharing your solution with the community! Hi. i am facing a delay problem from my gmail to outlook 2010. I receive new emails when i check on my web Gmail but when i open my outlook (gmail configured through pop.googlemail.com & smtp.googlemail.com) port 995 (ssl) and smtp 587 (Tls). Till 2 weeks back it was working perfectly but now it take almost 1 hour for my outlook to be updated with my new emails. Outlook shows that it is downloading email (e.g 1 of 5) but when it finish this indication, outlook is not updated with new emails. You can try to disable any Outlook add-ins and antivirus software you have installed during the last 2 weeks. If this does not cure the issue, create a test Outlook.com account to check whether the problem is with your computer, your internet provider or Gmail. Hi, Recently we have migrated from Google to Office 365. I have used Outlook 2010 to download my mailbox with Google. Google App sync with the option of limit download size of the mailbox. But when configuring Microsoft mail solution, as per the available facts only Outlook 2013 is supporting for download limit which starting from 1 month duration. Presently i am experiencing a problem due to outlook getting stuck while work on draft or deleted e-mails folders. I have already tried with exchange mode and IMAP mode but problem remain same. Appreciate your help on this to find out a solution to overcome from this. I am very sorry, but I have absolutely no idea on how to resolve this issue. My only advice is trying to contact Microsoft support service. Hello I'm trying to help my mum out. She has a windows 8 laptop, we got outlook 2013 on it and set up her bigpond email up. We can receive emails but we can not send emails. Are you able to help me out with a solution or does she need to take the laptop to someone? Hi, I am using Outlook 2013 on Windows 8.1 and I am haveing a weird problem. All of the sudden when I exit Outlok it no longer empties my deleted item folder. I have the "delete upon exit" box checdked on the advance settings and it worked until a about a week ago. It is not the end of the world but its somehwat annoying. Any thoughts? Sorry, I have no idea why that may happen. If you installed some Outlook update, or a new Outlook add-in a week ago, that would be the most obvious culprit. In your case, you should of course fix your account settings first. There's a good chance, this would fix the issue with stuck messages straight away. If not, you can try these troubleshooting steps, they should work for all versions, including Outlook 2007. 1/ Try differing port combinations for outgoing server. 2/ Create a new profile (requires you to setup all server information again). Is there an option to send all these messages at once, and not ony by one? We have configured a Office 365 email account in Laptop. There we are experiencing this problem, mails get stuck in outbox. We have to click on Send/Receive All Folders to force it to leave the outbox. 1. The account is configured on Local Administrator account instead of user domain log in. 3-Laptops(2 are Active), 3-4 Mobile devices (only 1 is active now) all other devices have been formatted. 3.In one Laptop it is MS Office 2013, other MS Office 2010 this is the one in which we are facing problem, it does not prompt for password even it s changed. Where as it prompts for password in the domain user profile log in. Sorry if my explanation is too long. But to explain you better and to fix it. I use windows live and we get an error message that our email with picture attachment could not be sent. It says to delete it but we cannot find it. Now we can not send any emails. Can you help? How toward drop tummy pounds? I can able to receive emails in outlook but im not able to send it. If i send means its showing "sending completed" But mails are still in outbox without deliver. Kindly advice. Hi mam I am facing MS outlook 2010 issue more than one month mail struck in outbox taking more than 20 min to go. But when ost set as default issue not occur kindly suggest some solution. Thank you for your help. Your article is clear and most useful. Also, thank you for for owning up when you cannot answer a question; it is quite frustrating when an answer is provided which is incorrect. You appear to be careful not to do that. Dragging stuck Outlook em back to 'draft' worked well. Was instantly able to re-send successfully.